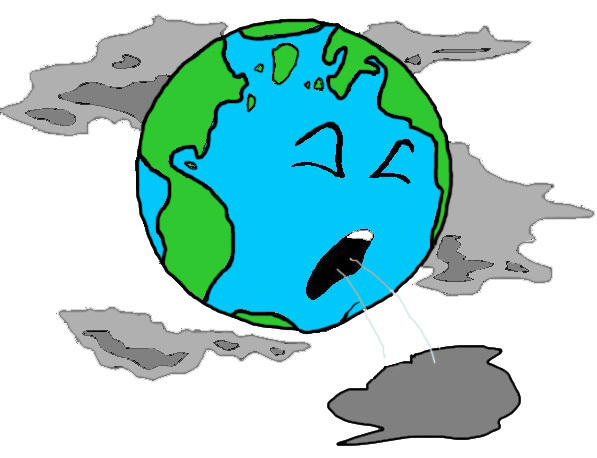 In this two-lesson unit, kindergartners learn about preventing vehicle pollution. 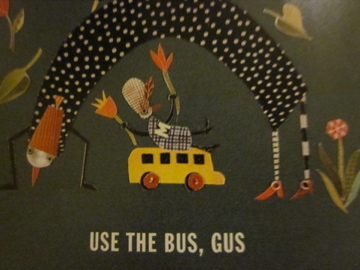 In the first lesson, “What is Car Pollution?,” they read part of the children’s book OK GO! by Carin Berger to learn about vehicle exhaust. Then they illustrate the concept on maps of their city. 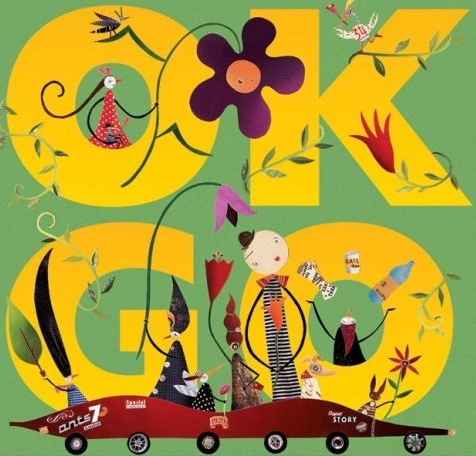 In the second lesson, “Better Ways to Get Around,” they finish reading OK GO! and learn about better ways to travel. 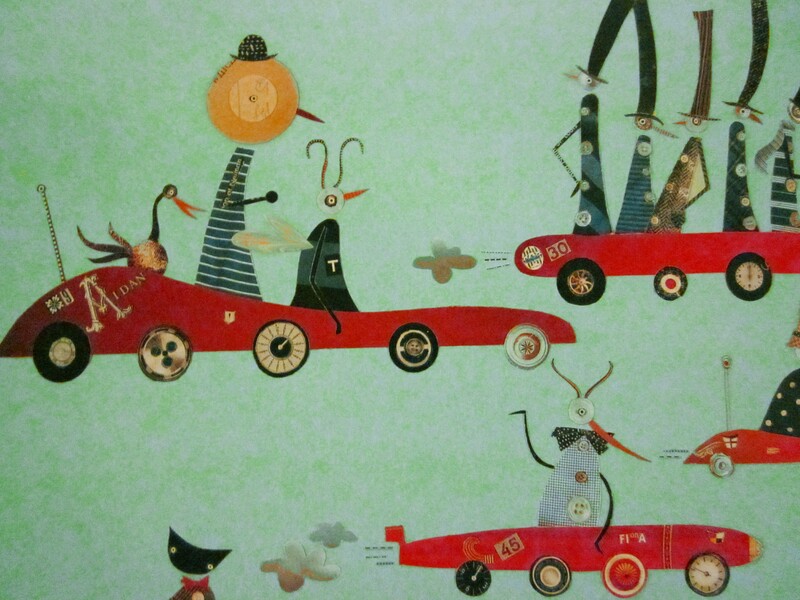 Then they make a collage of an earth-friendly vehicle out of recycled materials. To teach this unit, you will need: 1). 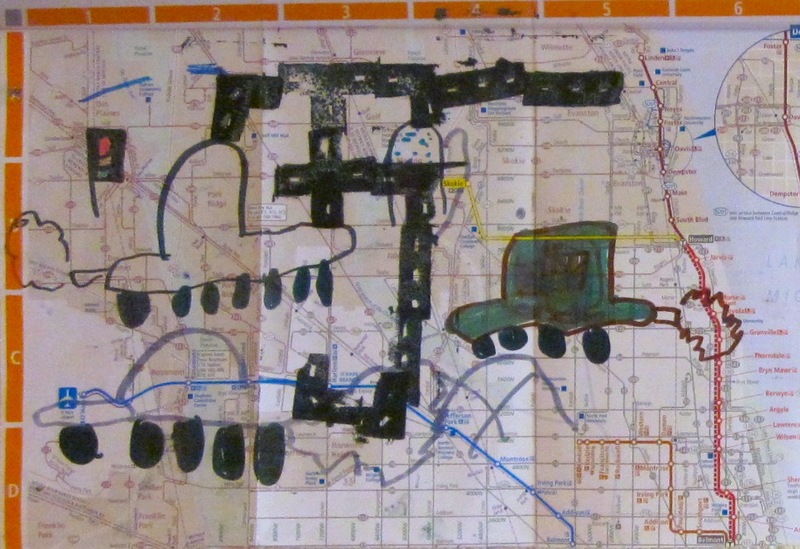 a copy of OK GO!, maps of the city you live in, markers, and road stamps (optional), and 2). construction paper, newspaper, magazines, and gluesticks. Essential Questions: What is the smoke that comes out of cars? Is it bad for us? How can we make less of it? Most students will recognize that smoke comes out of the back of their cars when reminded with a picture (they just won’t know what it is). Students should also be able to recognize what types of transportation their city offers, and how they get around every day. 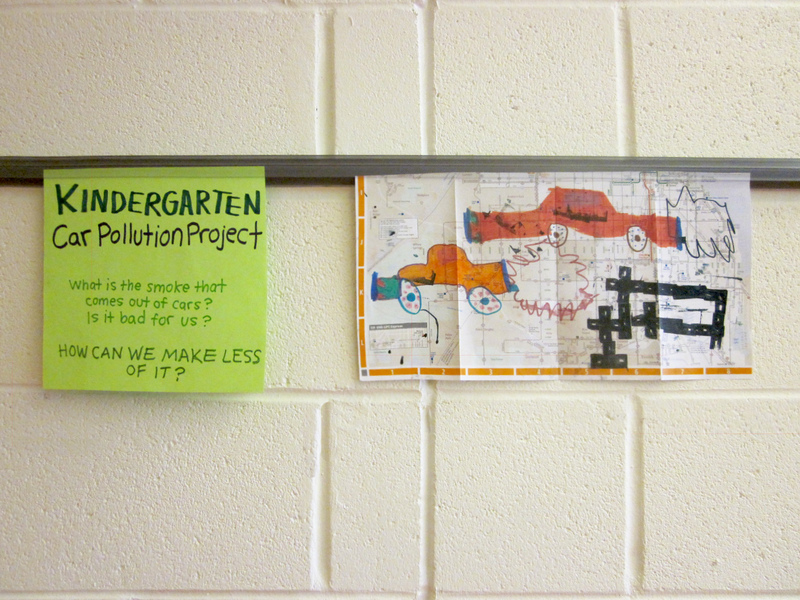 Even kindergartners can learn about pollution if explained simply. People of any age can become informed and be inspired to make changes in their community. Agenda: Read the first part of OK GO! as a class and discuss. Then use markers to draw cars (and the smoke that they make!) on maps of the city students live in. Students can also add roads to their drawings with markers or by using road stamps if they are available. 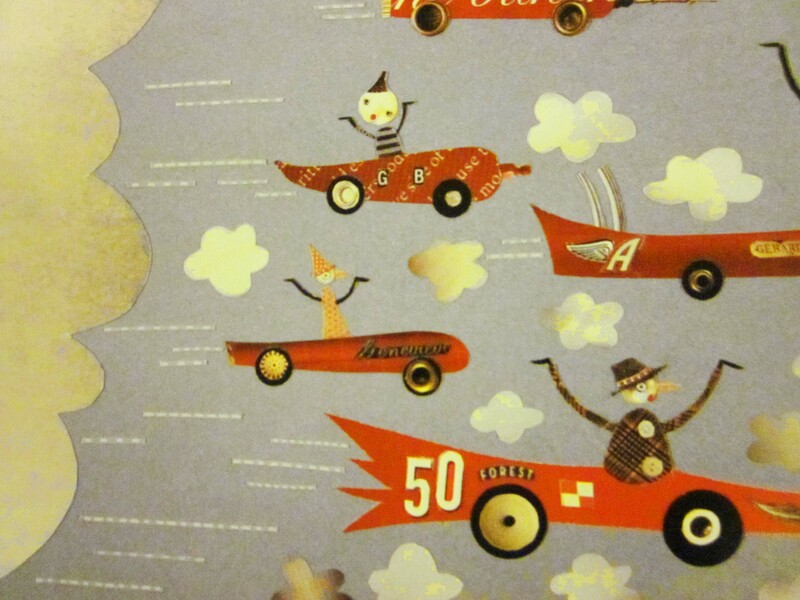 But after zooming around for a few pages, it gets nearly to smokey to see the cars, and one of the creatures has to yell “STOP!! !” (This is as far as we read in the book for the first half of the unit). This leaves students guessing as to what happened. Where did all that smoke come from? What is it? Some of my students thought the cars had crashed and made the smoke.We had to flip back a few pages to see that all of the cars were making a little smoke from the beginning. And they didn’t run into each other! Other students thought that the smoke came from the cars’ tires when they went really fast. I showed my students a photo of a real car and its exhaust pipe. 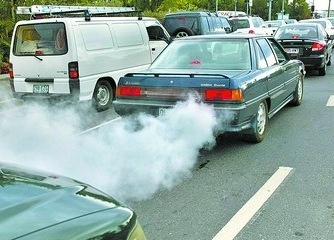 (Even when the car isn’t moving – just sitting at a stop light – it still makes smoke!) Most of them realized that they had seen this before in their driveway or on the road, especially on cold days. Then we discussed whether we thought the smoke was good or bad for us. I showed them a picture I found on the internet of the earth coughing from all the smoke. We thought about how many cars there were in the whole world and how much smoke they made. We went around the room and each student said how many cars their family owned, and I counted them up on the board. 45 cars in one class! We decided that there were too many cars and probably too much smoke. This is an example of the type of artwork students can create based on this lesson. The requirements were to 1). draw cars, 2). add more roads, and most importantly 3). “don’t forget to draw smoke coming out of your cars!.” (Note: my class completed the road step first with custom stamps that I made, but the ink was very messy. This step could be skipped, or replaced with markers). I drew an example car up on the board out of basic shapes before we began. 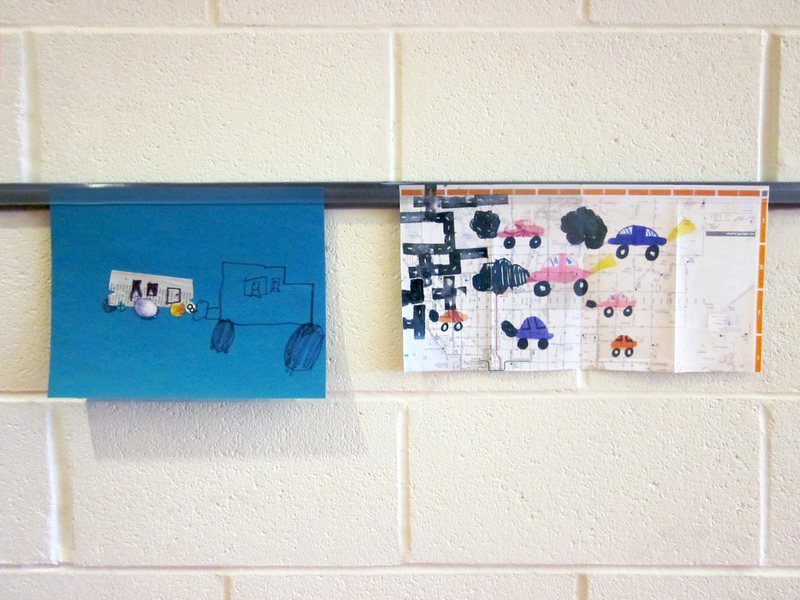 Your students’ cars don’t need to look like yours – this is just an exercise to help remind students what is on a car (windows, doors, wheels, headlights, the exhaust pipe, and smoke). 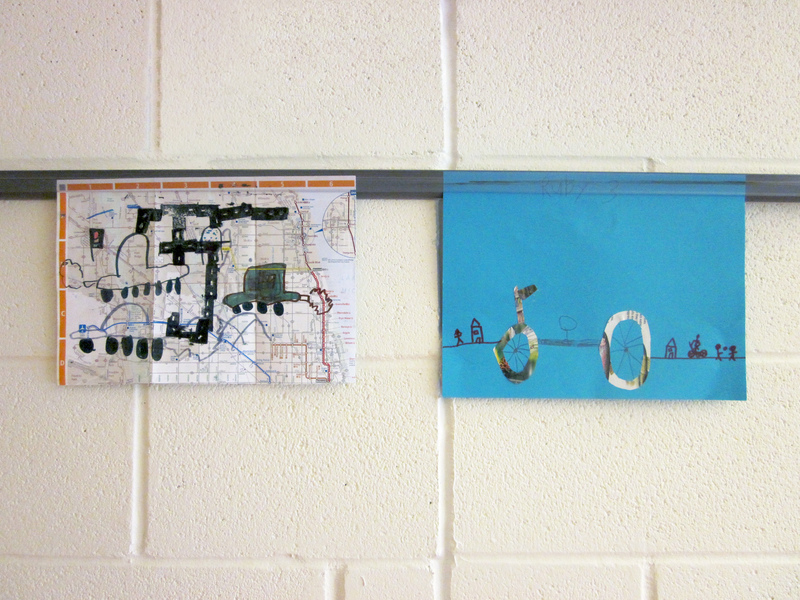 Then I gave each student a map of Chicago to draw their cars on. This map base really makes the student work look like complex, finished pieces of art. Let students work on these the second half of the first day, and all of the second. Add more time if needed. Agenda: Finish reading OK GO! and discuss what kind of ways there are to get around in their city. Decide which ways are good for the earth and which ways are bad. 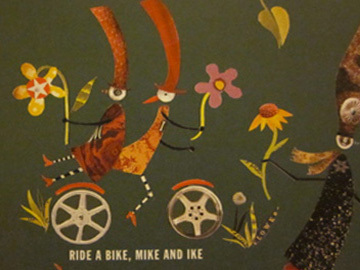 Then make a collage inspired by Carin Berger’s illustrations of one earth friendly way to get around town. We thought about ways we could get from one place to another in our city (Chicago). Some ways made no smoke at all – walking, skateboarding, biking, scooters – and some did – cars, buses, taxis. Some ways only carried a few people at a time – bikes, cars, scooters – where others carried a lot – buses, the L, Metra trains. What is the best way was to get to school – walking, being driven, or taking the school bus? Easy – walking makes no smoke! But what is better, a car or a bus? One student yelled out right away “the bus – the bus holds more people!” All of my students caught on very quickly and I was very proud of them. This is an example of the type of artwork students can create based on this lesson. The main idea was for each student to pick a way to get around that is better than a car (bike, bus, walking etc.). The above student chose to make the Chicago ‘L’ (the subway). The requirements were to 1). pick a color of construction paper (greens or blues) for the background, 2). cut the main shape of your vehicle out of newspaper, 3). 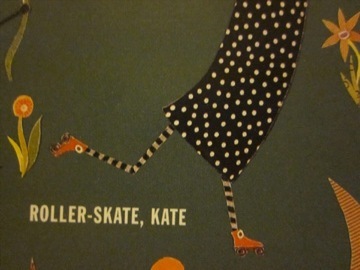 find circles in magazines and cut them out for your wheels, 3). glue everything down, and 4). add details with markers. I modeled each step before we did it. Let students work on these the second half of the first day, and all of the second. Add more time if needed. 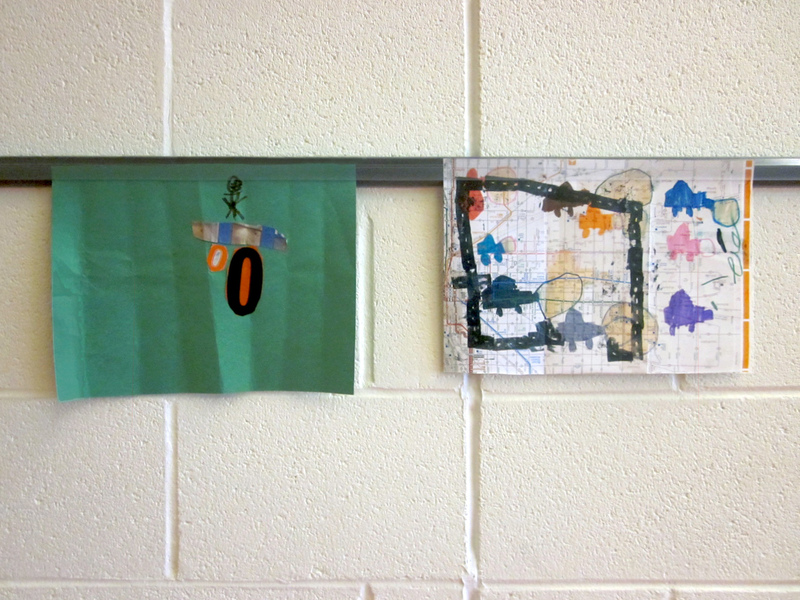 At the end of the unit, hang both projects on the wall side by side for contrast. Objectives: Students will: 1). Draw the pollution that comes out of cars on their first art piece, 2). Recognize and pick a form of transportation that is better for the earth than driving a car, and 3). Complete two works of art. State Standards: 27.B.1: Know how images, sounds and movement convey stories about people, places and times. 27.A.1b: Identify how the arts contribute to communication, celebrations, occupations and recreation. 26.B.1d: Demonstrate knowledge and skills to create visual works of art using manipulation, eye-hand coordina­tion, building and imagination. Literacy: Students will be read to from a children’s book, and can follow along. Adaptations: Decrease the number of steps and requirements in the art-making process for students with learning or physical disabilities. I use a lot of art in my own teaching, and I just love this project! 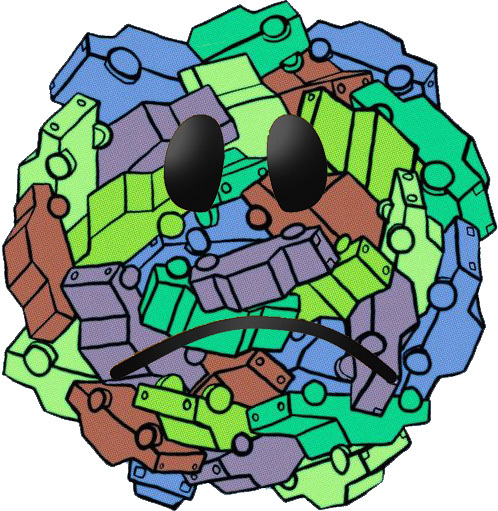 It is a great illustration (if you’ll allow me the pun!) 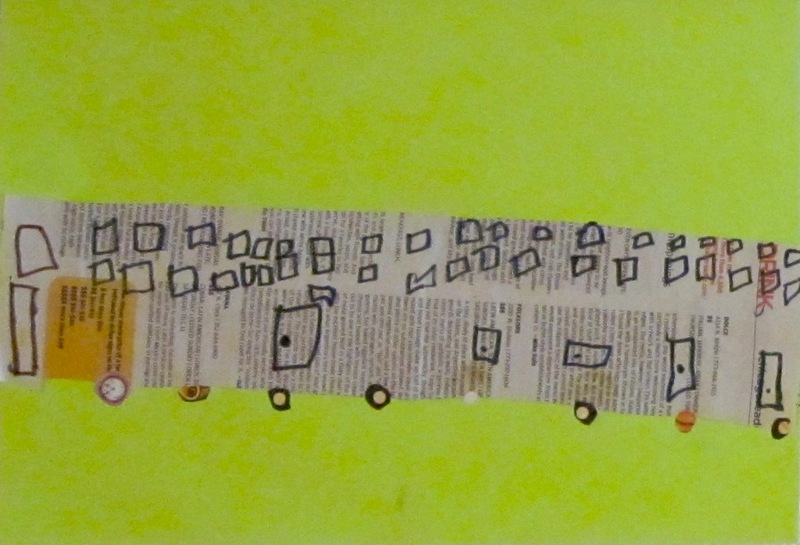 of how important art teachers are in the teaching of reading. The rhymes are wonderful! It is certainly time that we all taught children an awareness of our impact on the environment, too, so you get an A-plus from me!! a friend brought your blog to my attention. it makes me so happy to see what innovative work you are doing with my book! brava!!! 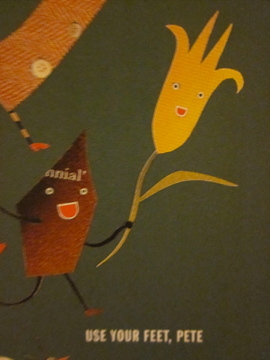 It was a delight to work from your illustrations. Students were definitely intrigued. I’m glad you felt we did justice to your work!